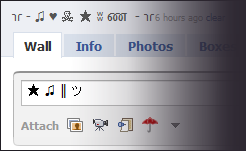 Text Emoticons and SmileysText emoticons and smileys for messages, chat and status on Facebook, Myspace, etc. Made with and without the use of cool text symbols. All text symbols for Facebook ? Collection of cool computer text symbols. All facebook symbols. ? ? ? My large hand-made list of more than a hundred cool characters. Truly amazing! ? ? ? Encool tool - generate cool text with symbolsMake cool text messages with special text signs and symbols. Encode your text with cool symbols. Fantastic funny accent letters and symbols. ???? ??? aboqe - Flip message letters and text characters Upside Downaboqe generator is a tool that can flip your text upside down by using special letters, symbols and characters. Flip your messages 180�. For Facebook, MySpace, etc.